(TNS)—Let’s get one thing clear from the start. Airfares are volatile. While it’s true that flying on a Tuesday or Wednesday is cheaper than on a Friday or Sunday, there is no magic time of day, day of week or month of year to book a low airfare. Airfares can change in a heartbeat, high one minute and low the next, and the trick is to buy when a fare on your route becomes a bargain. First, sign up for airfare price drop alerts. Many websites now offer these at no charge, sending out lists of unusually cheap fares (some of them “fat finger” mistake fares), that while valid for travel over several months, usually expire quickly. Take a look at theflightdeal.com, hitlistapp.com, secretflying.com, exitfares.com and Fly4free.com. They often have the same deals, but I suggest signing up for all of them and to follow them on Twitter if you use it. Other sites, such as Kayak.com, Yapta.com and GoogleFlights.com, will track fares on specific flights and dates and alert you to price drops. When you see a great deal, buy it (you can always change your mind and cancel within 24 hours, per U.S. DOT regulations). My go-to sites when I arrange personal travel are Kayak.com (I love using its flexible month and flexible weekend options) and two Google offerings: Google.com/flights/explore and Google.com/flights. 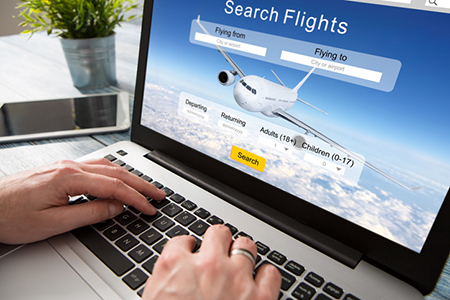 The “explore” site allows you to choose a trip length, departure city and an arrival city or region (such as “United States,” “Europe” or “Boston”) and then displays a selection of the lowest fares available over the next few months. It’s perfect for anyone with flexible travel dates and destinations. The “flights” site asks you to choose origin city and destination along with specific travel dates so it’s more geared to those with less flexibility; however, none of these sites include Southwest Airlines, so you also need to compare at Southwest.com. If you’re date-flexible, use Southwest’s low-fare calendar option. It may be cheaper to fly out on one airline and back on another using one-way fares, and OTAs such as Expedia and Priceline are a good place to find out. They also sell air plus hotel packages that usually cost less than buying separately and they sometimes have fares that are much lower than the same flights and dates sold directly by the airline sites (I recently saw fares on Priceline to South Africa on Dutch airline KLM that were hundreds less than if bought on KLM.com and fares on Delta to Italy that were much cheaper on Expedia than on Delta.com). Speaking of Delta, that airline restricts where its airfare data appear on some popular third-party sites such as Hopper, Hipmunk, TripAdvisor and FareCompare.com, so beware. JetBlue recently removed its fare data from several “meta search” sites as well. Copying ultra-low-cost airlines such as Spirit and Frontier, now Delta, American and United also sell bare-bones economy class fares. On domestic routes, they typically cost $40-$60 (round trip) less than regular economy, although the savings can be greater to international destinations. Buy one of these fares and, except on Delta, you’ll pay even for a carry-on bag, unless it’s small enough to fit under the seat in front of you; you won’t be able to choose a specific seat before check-in (which means you’ll end up in a dreaded middle seat); and your fare will be entirely non-refundable and non-changeable. Although I’d never buy one of these airfares, my millennial friends, who apparently travel with just a change of clothes and a toothbrush stuffed into a backpack that slides under the seat, tell me that they’re worth the inconvenience.